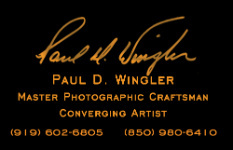 The Legacy Portrait is a very distinct style created by Master Photographic Craftsman Paul Wingler. It has many of the attributes of the Traditional Portrait, however, it adds strong elements of storytelling about the individual or group that is having their portrait taken. Sometimes this is referred to as a piece of Converging Art; a form of art where new technologies and traditional art come together thus making it a work of art that is to be cherished by generations to come. The Legacy Portrait is printed on a high grade, heavy weight canvas and can be embellished with acrylics to the artists taste and then sealed with a UV protective coating which further enhances and protects the portrait.